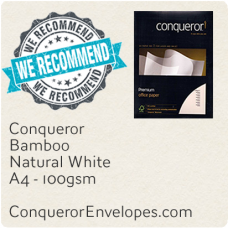 This is our personal favourite. 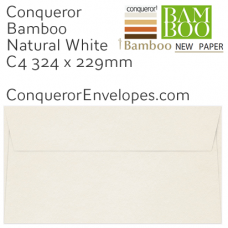 The quality and finish of this paper is superb and the eco credentials it carries are unmatched anywhere. Made from bamboo grass which renews itself every 12 months. 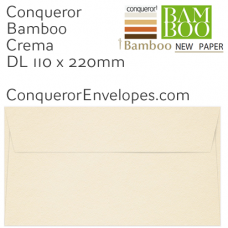 What is there not to love about this amazing paper and matching envelopes. 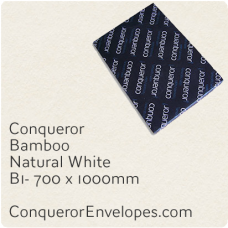 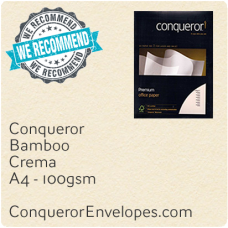 Conqueror Bamboo Eco Envelopes... Bamboo smooth super eco envelopes, perfect for any business o..
Conqueror Bamboo Eco Envelopes... Bamboo smooth super eco envelopes, perfect for any business..
Conqueror Bamboo Eco Smooth Paper... Beautiful super eco smooth bamboo Conqueror, in stock here i..
Conqueror Bamboo Eco Smooth Paper... Beautiful super eco smooth bamboo Conqueror, in stock here..
Conqueror Bamboo Eco Smooth Paper... Beautiful super eco smooth bamboo Conqueror, in stock he..
Conqueror Bamboo Eco Smooth Paper... Beautiful super eco smooth bamboo Conqueror, in stock ..